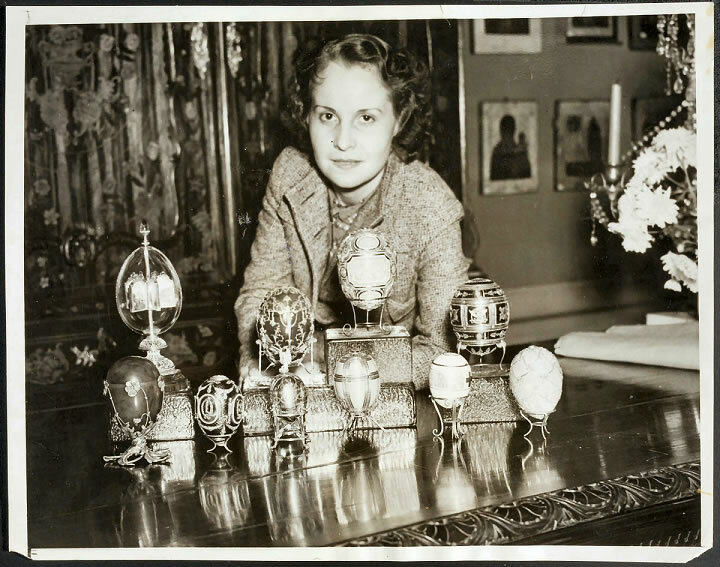 "A $1,000,000 Worth of Easter Eggs"
The photo above from Mrs Lilian Thomas Pratt personal papers shows ten Imperial Easter Eggs, now owned by various museums, foundations and private persons in the United States and Switzerland! 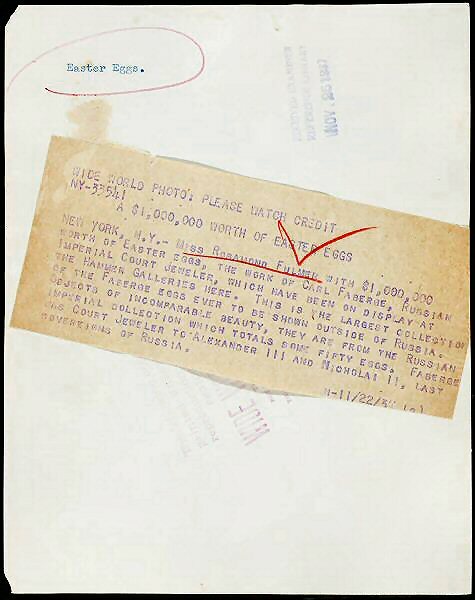 The archives' downloadable aid says that the $1,000,000 Worth of Easter Eggs, were photographed together on November 22, 1937. It was not known there existed photographs of the Exhibition, but yet here we see ten of the Imperial Easter Eggs exhibited, photographed on the opening day! According to the catalog of the exhibition, on that November date the 1893 Caucasus Egg, the 1896 Egg with Revolving Miniatures, the 1899 Pansy Egg and the 1915 Red Cross Portraits Egg were still owned by the Hammer Galleries. The six other Eggs apparently already being sold (by Hammer) to various new owners. The exception here is the 1906 Swan Egg that was at the exhibition being owned by a Mr Charles Parson from London, who had bought it in 1933 from Wartski. Armand Hammer later (in 1939) on behalf of Mr Parson, sold the Swan Egg to Egyptian King Farouk. The catalog mentions an 11th Imperial Easter Egg, the 1894 Renaissance Egg though not marked by asterisks (*), indicating that the objects were not in possession of the Hammer Galleries, Inc. Why the Renaissance Egg is not on the photo is unknown. Of the ten Eggs photographed, Mrs. Pratt in 1937 owned three. She later (ca. 1944) acquired the 1903 Peter the Great Egg from the Schaffer Galleries, now known as A La Vieille Russie and (ca. 1945) the 1896 Egg with Revolving Miniatures from Hammer Galleries. Nine of the above Eggs, plus the 1894 Renaissance Egg, were acquired directly by Armand Hammer from the Sovjet Union. The 1906 Swan Egg was acquired by Emanuel Snowman (Wartski, UK). 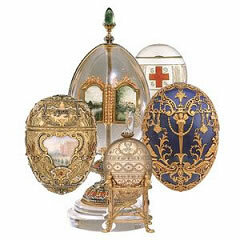 See also Fabergé Collectors for an overview of the Eggs bought by Mrs. Pratt, Armand Hammer and Emanuel Snowman.